Villa Collis is a new, year-round, luxurious yet intimate high-standard holiday resort. 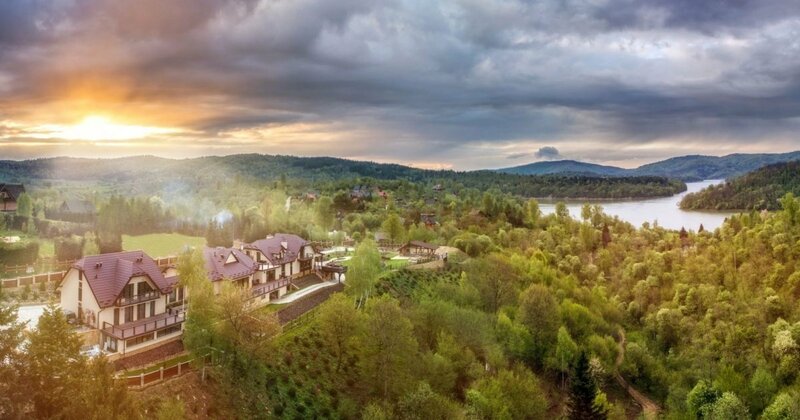 Located in the upper part of a peninsula (collis means “hill” in Latin) in Olchowiec, a place in the heart of the Bieszczady Mountains, the resort is surrounded by Lake Solina on the one hand whilst on the other it neighbours Otryt, the wildest mountain range of the Bieszczady Mountains. A beautiful view of the lake, the forests and mountains, direct access to the lake and to the small Bieszczady ring road, neighbourhood of many hiking and biking trails as well as the upper San valley, calm, quiet and beautiful nature all make the place truly special. Being a year-round facility, Villa Collis offers an indoor, ozonated pool equipped with many massagers and counter-current as well as jacuzzi, a wading pool and a beautiful relaxation terrace overlooking the lake and forests. There can also be found a SPA, a Finnish sauna, a Roman bath, a massage salon, a beauty salon and a mini fitness club. The beauty salon provides massages carried out by qualified masseurs and a wide range of beauty treatments using the latest exclusive cosmetics. Facility’s intimate restaurant server tasty dishes exclusively for its guests and fulfills individual culinary wishes. Paying attention to our guests’ satisfaction dishes are prepared using fresh and local products and the resort’s bar has various refreshments to suit each guest’s needs, including a wide range of Bieszczady beer and quality tasty wines. For our guests’ convenience room service is already included in the price of the room. The facility provides 10 rooms, three of which are apartments. Most rooms offer terraces or balconies overlooking the lake and forests. The rooms are spacious and of luxurious standard (satellite TV NC+, air conditioning, a fridge, a mini bar, WiFi, coffee service, towels, bathrobes, slippers, toiletry). Most of facility’s attractions are available at no extra charge. Our guests can rent an electric-driven boat or off-road vehicles to explore the surrounding off-road routes. At our guests’ disposal there is a private beach with a marina as well as a forest strolling facility with streams and charcoal burning, a multi-functional sports field, a playground, an all-year barbecue gazebo with a bonfire capability where concerts, performances and outdoor events can be organized. There is also a professional helicopter landing site as well as an internal and external parking lot. Through the reception desk we offer the possibility to organize any tourist attractions available in the Bieszczady Mountains and customize our guests’ stay according to their individual needs. The price of the room includes free use of the pool, saunas, buffet breakfasts and a la carte dinners. Staff of a dozen and a half do their best to provide the most comfortable conditions and individual service. All facilities, including the restaurant, SPA and the pool are available for the guests exclusively. The resort is guarded and unavailable for non-guests which makes the place exceptionally calm and intimate. We provide our guests with transport from the Rzeszów airport (Jasionka). Villa Collis is the most exclusive place in the Bieszczady Mountains yet accepting the full individuality of its guests. This is the place where one can find real calm and enjoy the beauty of the Bieszczady nature at any time of year. Therefore all object’s facilities, including the restaurant, are available only to hotel guests and their privacy is carefully protected. The hotel’s intimate nature and the staff’s individual approach to each guest both will ensure peace and privacy for everyone who needs them. Minimum period of exclusive renting is 2 days. In low season it is possible to negotiate prices depending on how many days the stay lasts and how many people it involves.